You need to re-host, and eventually expand from, your legacy sort product operations when migrating to open systems. MVS (z/OS) and VSE JCL sort steps will not work in a Unix shell or Windows command line environment. Parm conversion will be necessary. The IRI CoSort package's Sort Control Language (SortCL) program is the destination for sort parms written for z/OS (MVS) and VSE JCL sort software, first propagated by IBM in DF-SORT. CoSort includes free sort card conversion utilities called MVS2SCL and VSE2SCL. These utilities translate the relevant sort (select, sum, etc.) steps from a JCL stream into a functionally-equivalent SortCL job specification file that will run on Unix, Linux, and Windows. Metadata is converted and accommodations are made for multiple output and data types. This advanced sort parm conversion utility also sets up job scripts that can leverage the full range of CoSort data transformation, conversion, reporting, and protection functionality for your production data sets. The conversion wizard shown below demonstrates the conversion of one or more mainframe sort decks to SortCL job scripts. You can browse to identify the location of the parms, and then automatically convert them for use in SortCL. The middle window shows advanced options available for these conversions. 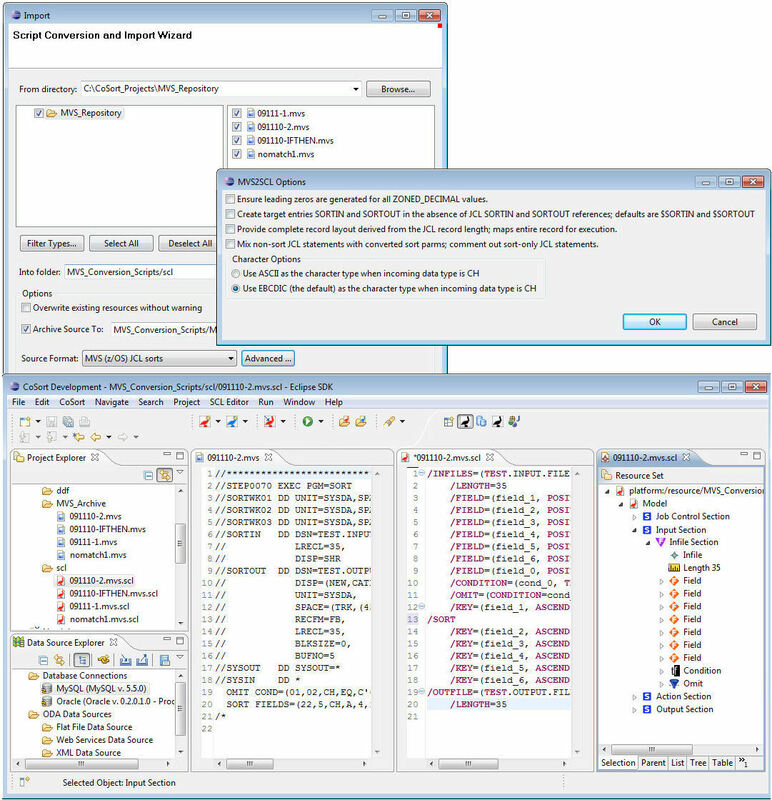 The bottom window shows from left to right: project explorer files (including the source and target job scripts), an editor displaying the source job script, a display of the target job script, and a tree view of the components of the target job script.